Sometimes in the excitement to try on your new suit, you take the plastic tag and rip it off, and a piece of the fabric comes with it. 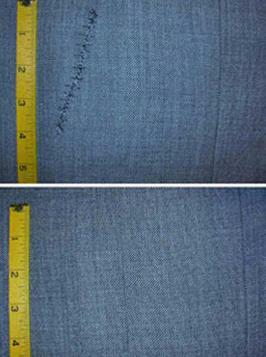 We see those things happen often, and a small re-weaving will make it perfect again. Other mishaps that we've seen in our store range from moth holes to rips to cigarette holes in the fabric. Our trained weavers can work their magic so you will never even notice the fabric was hurt. Many times when our clients pick up their damaged clothing, they can't even see where the repair was made, and they don't remember themselves where it was. With sequins, beads and crystals on so many garments now, replacing them makes the garment new again. Our restorers will work around the clock to make sure your clothing is done on time, and when you need it.